We left Malelane and the Kruger very early and arrived at the Mananga gate to Swaziland half an hour early at 06h30. The drive through Swaziland was uneventful except for the potholes on the 40 kms stretch between Siteki and Big Bend. We arrived at Ndumo midday with the intention to camp for one night before we joined the Game Rangers weekend – staying in the huts. However we negotiated a good price to upgrade from camping to the huts for the night and took full advantage of it. Once settled in we took a drive to the Nyamithi hide passing the Vulture Restaurant on the way. At the Restaurant we spotted an adult Palm-nut Vulture feasting on one of five giraffe. Also noted were a pair of Spotted Thick-knees behind one of the carcasses. At Nyamithi hide it was very quiet as the water level was quite high. However Sally noticed a Little Bittern in the reeds immediately in front of the hide. The next morning at 06h00 Sally and I went with Bongani on a drive to the back side of Nyamithi Pan and Banzi Pan. This was the first time that some of the roads were passable after recent rains – in particular around Banzi and Bongani spent a bit of time cutting and removing fallen trees and bush across the road. That said, it was a very productive drive and we did not get back till after 11h00. Here are pictures of a smattering of the birds we saw. African Darter – poised just like a snake. On this drive we heard and saw our first Woodland Kingfisher of our trip so far. Not one seen nor heard in the Kruger!! The one we observed here was giving as good as he got from an annoyed Broad-billed Roller. Late that afternoon we had a short but heavy thunderstorm which effectively closed the back roads around the Banzi Pan where we had gone. We were fortunate to arrive a day early. In the camp a juvenile Spotted Eagle-Owl was seen. The Game Rangers long weekend involved three walks with guides and a Game drive around the back of Nyamithi Pan as well as a sundowner at Nyamithi Pan. On the walks we were taken to Shokwe Pan, the western side of the park and a central walk near the main gate. On Friday we left the camp and had only reached the camp entrance when Bongani spotted an unusual implement in the bush by the road – an arrow. The park manager and rangers were called to deal with potential poachers. Then 100 metres further along the road Bongani spotted a knife in the road. The manager and rangers were called again. Some start to what was meant to be a game drive. 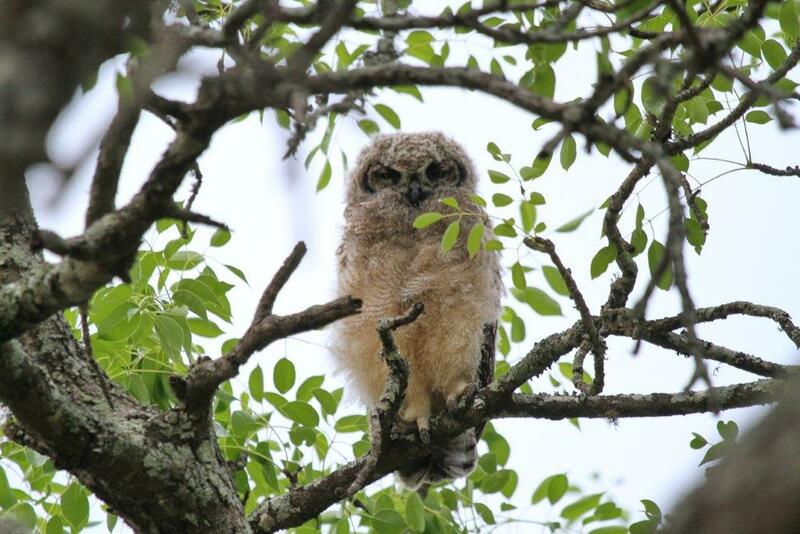 Here are some photos of birds seen on the Game drive and on our walks. Cuckoo – to be identified – African or Red-chested. Leguaan – about 5 foot long. The camp has many large trees habituated by many birds. this is where the Spotted Eagle-Owl was seen. A Purple-crested Turaco paid a visit and a pesky Scaly-throated Honeyguide called seemingly from everywhere but where I was looking. Eventually I managed to get a shot or two of each. There was little time during the weekend to go off and do your own thing. However on the last lunch break, we managed to visit the Nyamithi hide again – hoping to see the Little Bittern. We were not disappointed. The Vulture Restaurant was also active with a number of Yellow-billed Kites and a juvenile Palm-nut Vulture. Ndumo was the most productive of all the locations we visited with 181 different bird species observed. After 4 nights at Ndumo it was time to leave for our final destination at Sugarloaf campsite in St. Lucia. See Part 11 to follow. This entry was posted in Home, Posts, Reports and tagged Ndumo, Zululand and the Kruger. Bookmark the permalink. Common Buzzard = Steppe Buzzard. I think it very unlikely to find a Forest Buzzard in the Ndumo habitat. The land invasion problem still lingers from what we could gather – however it has not been as significant lately. But who knows… no political will for some reason? Common Buzzard = Forest Buzzard? Did you detect a land invasion problem at Ndumo?